In 1949, chemist Emanuel Goldberg started making polyethylene pipette holders in Rochester, New York. By the 1960s, he'd branched out into other labware items - and one day found that his own technicians were using Nalgene bottles on weekend hiking trips, enthusing about their durability and lighweight construction. As the Nalgene company grew (the name originates from his wife Natalie Levey Goldberg's initials), it coincided with the 1970s 'Carry In/Carry Out' movement begun by US environmentalists - aimed at discouraging outdoor enthusiasts from burning or burying their drinks containers. When the company president was told that his son's scout group were using Nalgene bottles on camping trips, the decision was made; Nalgene's outdoor division was born. 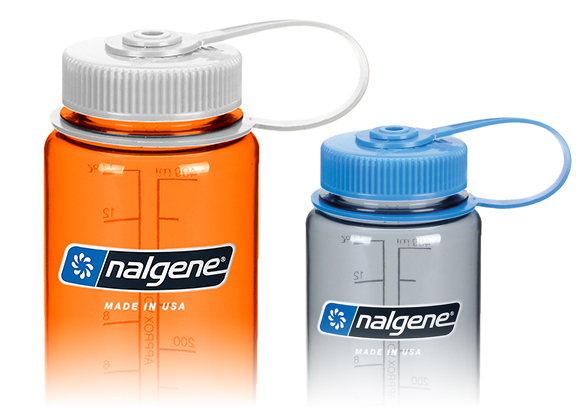 In the years since, Nalgene has gone from strength to strength. With their scientific pedigree, Nalgene bottles are as durable and reliable as ever, but current models are also dishwasher-safe, BPA-free and come in a range of funky colours! Now, as the world becomes increasingly aware of environmental issues and the crisis of plastic waste, a Nalgene 'Bottle for Life' is more relevant than ever before. Although recycling rates are slowly increasing, the vast majority of single-use plastic bottles end up burned or in landfill. Many also find their way into the world's oceans, creating an environmental blight which scientists say is a major threat to eco-systems. Buy a Nalgene and fill, drink and re-use - it's as simple as that! As Nalgene’s official UK distributor for over 20 years, First Ascent is proud to introduce the Print Nalgene programme to a wider audience. With extensive experience of guiding customers through the design-and-print process, we’ll work with you to deliver a premium, bespoke product that fully meets your requirements.